A series of protests by the Irish Nurses' Organisation began on Tuesday, with action taken at Dublin's Mater Hospital, Cork University Hospital and Roscommon General. The protests are part of a campaign to highlight the continuing problem of overcrowding, which Minister for Health Mary Harney promised would be improved by March. Patients Together, the lobby group for patients' rights, says it fully supports the action being taken by frustrated staff. 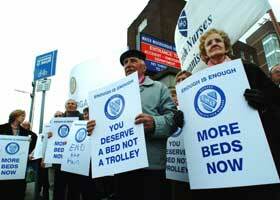 More protests at Tallaght Hospital Dublin, Cavan General and Mayo General are planned for Thursday.